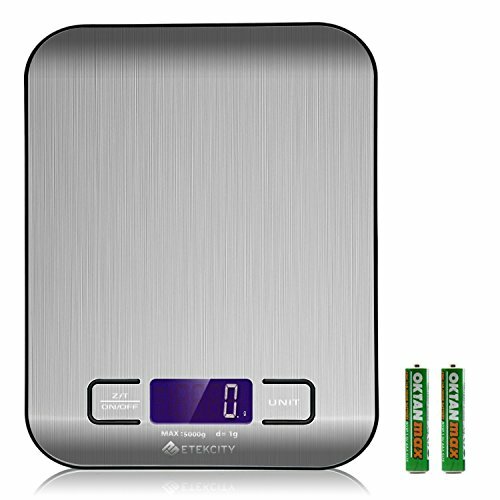 Customers seeking a precise, accurate kitchen scale which is portable, aesthetically pleasing, and includes a wide array of functions will want to think about the Etekcity Digital Kitchen Scale Multifunction Food Scale. This scale is incredibly popular and highly rated. Let’s see how it measures up. Lots of Extra Features: This is not just a scale; it is an all-in-one measuring device for all of your cooking needs. Additional features include quick unit conversion and volume measurement support. With these features, you can get your portion sizes exactly right. Tare Function Included: This feature resets the scale to zero when you add an empty container, which enables you to then add contents to weigh without the weight of the container being incorporated into the resulting measurement. Auto-Off: Hands covered in food? You don’t need to stop to wash them and switch off the scale; it will turn itself off after two minutes without use. The company claims this scale is accurate to within around one to two percent, which was what I discovered with the unit I tested as well. This is sufficient for home use. This is a sleek and attractive scale. It adds to the décor of your kitchen rather than subtracts from it, and does not increase your clutter. The compact, lightweight design is a big benefit. If you currently have something bulky or heavy that you're unwilling to use, this will change how you work in the kitchen. It's really easy to grab and put back as needed. The scale is incredibly easy to use, clean and maintain. With grams, you are limited to three-gram resolution. You cannot display just one gram. The backlight on the display shuts off after a few seconds. This is to save power, but it annoys some users since they say the display can be hard to read without it. Personally, I didn’t have a problem, even with the backlight off and my contact lenses out. I would recommend this product most for home chefs who are tired of cumbersome scales and are looking for something with a lower profile which still offers all the features needed to prepare delicious, perfectly portioned meals. Having tested out the Etekcity Digital Kitchen Food Scale, I can certainly see why it has garnered thousands of excellent ratings from happy customers. It is a reasonably priced unit which packs a lot of features into a compact, lightweight appliance that is easy to use and provides accurate readings. 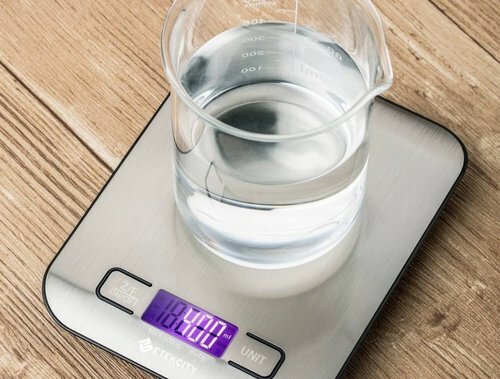 If you are still searching for the perfect kitchen scale, give it a try; it is everything you could need in one simple package.